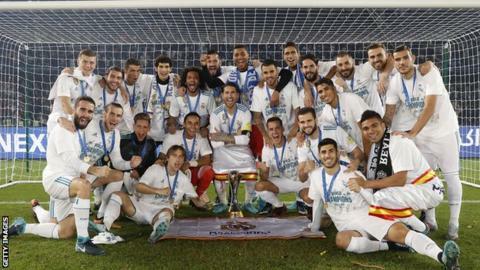 The Club World Cup is under way, with Real Madrid looking to win a third successive title. A Cristiano Ronaldo goal ensured the La Liga side beat Brazilian club Gremio in the final last year to defend the title they won for a second time by defeating Japan’s Kashima Antlers in 2016. Real will take on Kashima in the semi-final this year but what else do you need to know about the tournament? A total of seven teams are competing in the annual competition, six continental winners as well as the hosts. Where and when are the fixtures? New Zealand’s Team Wellington have already been knocked out on penalties by United Arab Emirates side Al-Ain, who then beat Esperance de Tunis of Tunisia 3-0 to set up a semi-final against Argentina’s River Plate on Tuesday, 18 December (kick-off 16:30 GMT). All matches up to this stage will be played at the Hazza bin Zayed Stadium in Al Ain. Kashima Antlers beat Guadalajara of Mexico 3-2 in the other second round match to set up the semi-final against Real on Wednesday, 19 December (kick-off 16:30 GMT). This match, as well as the third-place play-off and next Saturday’s final (kick-off 16:30 GMT), will be played at the Zayed Sports City Stadium in Abu Dhabi. Kashima took Real to extra time in the 2016 Club World Cup final but the Spanish side won thanks to a Cristiano Ronaldo hat-trick. Any household names in action? Real Madrid are the most recognisable team in action, while Colombia international Juan Quintero scored the stunning extra-time goal for River Plate in their Copa Libertadores final victory over Boca Juniors. Al-Ain striker Marcus Berg played for Sweden against England at this summer’s World Cup, with former Fulham and Mexico defender Carlos Salcido currently captaining Guadalajara at the age of 38. What is the history of the tournament? It was first played in 2000 and there was instant controversy with Manchester United pulling out of that season’s FA Cup to play. United had won the treble of Premier League, FA Cup and Champions League titles in 1999 and it was as winners of European football’s top competition that they were invited to enter the World Team Championship, which was being played in Brazil. United’s then chairman Martin Edwards said at the time the club had “no alternative” but to accept the Football Association’s offer to pull out of the FA Cup because the FA believed it could aid England’s bid to host the 2006 World Cup. In the end, United went on to finish fifth in the nine-man tournament, as Brazilian side Corinthians took the title. There was no tournament between 2001-2004 but it returned in a slightly different format in 2005 when Sao Paolo beat Liverpool in the final, while Chelsea were defeated 1-0 by Corinthians in 2012. Manchester United are the sole English winners, having triumphed in 2008, while Real Madrid and Barcelona have won a joint record three titles.